This contemporary hotel near downtown Vancouver features award-winning restaurants, deluxe guestrooms and suites, a pool, a fitness center and more. Take a stroll through Stanley Park, explore the streets of Chinatown or shop on fashionable Robson Street. Upscale rooms and suites feature breathtaking floor-to-ceiling views, signature Hyatt Grand Beds®, large wall-mounted HDTVs, Wi-Fi and more. 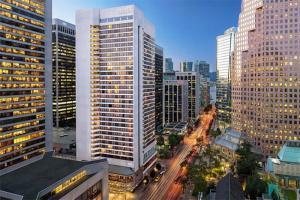 Located near Downtown Vancouver by the Convention and Exhibition Center.